SCADA software focused on the control of energy projects. Easy to use SCADA system fitting any project’s needs. iControl flexibility allows adaption to to any schema or architecture, from standalone systems, to complex redundant schemas with remote clients and SQL data storage. iControl web viewer gives the flexibility to display the SCADA in real time using an Internet browser, but with all the safety requirements to block any dangerous activity. Institution in charge: IGRID SL. Purposes of data processing: Customer contact. Personal data retain period: Until removal request. Rights: You can exercise your rights of access, rectification, cancellation and opposition. The automation of the power grid requires the use of SCADA systems for the local control of each facility, as well as for the management of the entire network. iControl SCADA system solves these problems by allowing not only the local control of a facility, but also the management of facilities with thousands of devices and several simultaneous communication protocols. iControl is a SCADA system, specially designed for the energy sector, that is easy to use and configure. This allows it to suit the needs of any company regardless of the communication protocol, the type of RTU, or the format of the original data. iControl is the solution for the local control of automated substations and generation facilities, connecting directly to the RTU, via serial channel or LAN. iControl is available in both Standalone and Client/Server architectures. It also offers other functionalities such as server redundancy, automatic line coloring, data storage in SQL server, events notification via e-mail and/or sms, and generation of reports. This SCADA system can control all types of remote terminal units, regardless of manufacturer. iControl uses standard communication protocols such as IEC60870-5-101/104, DNP3.0, Modbus, and IEC61850. In IEC61850 substations, iControl will act as data client connected to the substation network, not only to the RTUs, but also to all the protection and measurement devices. It will send them commands and set points, and receive information regarding their status. Communication with key protocols: IEC61850, IEC60870-5-101, IEC60870-5-104, DNP3.0, Modbus. Control of up to 8000 RTUs. 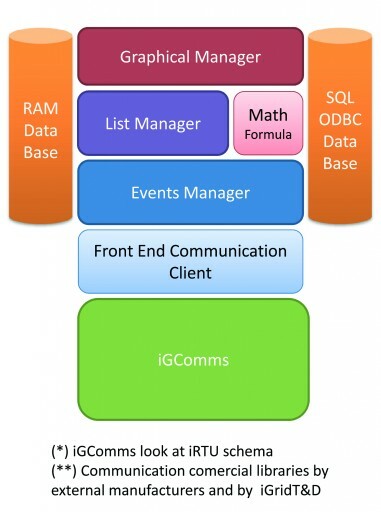 Standalone or Client / Server architecture. Compatible with any type of RTU and device, regardless of manufacturer. Total configuration of the control panel, according to customer requirements. User customizable library of components. Allows switching between the Configuration and Runtime modes without disconnecting the system’s operation. Very easy to deploy and backup. Does not need installation procedure. Just copy to a PC and run it.